Steve Jobs was a man whom I’d never met, but when I’d heard he passed away I felt as if I’d lost a dear friend. You see, I purchased my first computer in 1988, a Mac Plus, and little did I know how it would change my life. That small box, with 4 mb of RAM and a tiny monotone screen, became my constant companion as I transitioned from college to a career. Flash forward 23 years later. I’ve lost track of the number of Mac computers I’ve owned, from the Performa of the early ’90s to the MacBook Pro of today. My career as a journalist and photographer is defined by the work I do using the products that Steve Jobs envisioned would make life easier and more fun. How right he was. 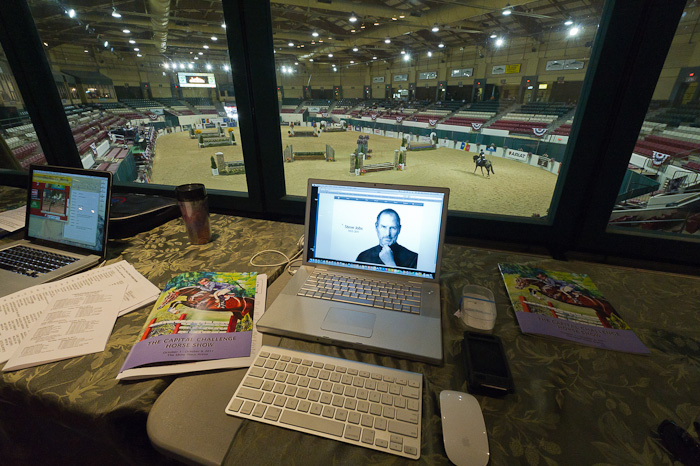 This week as I sit in the media center at the Show Place Arena in Upper Marlboro, Maryland, covering the Capital Challenge Horse Show, I’m surrounded by a half-dozen friends and colleagues all furiously typing on Macs. Many of us have grown up with these machines as our constant companions, and we often spend more time with them each day than we do with our own husbands. I know it’s silly to admit that you love an inanimate object such as a computer. After all, it’s just a tool you use to create an article or edit a photograph. But when I sit down and turn on my MacBook Pro, I’m instantly at peace. Each time I hear that start-up chime, it reminds me of the feeling I have when my best friend picks up the phone of the first ring. No, I didn’t know Steve Jobs. I have nothing to contribute to the many tributes and discussions taking place in the media in his remembrance. But like millions of other people around the globe, without him my world would certainly have been a much less beautiful place. What a lovely tribute to a champion of most of us and the picture is perfect. That one needs to be forwarded to APPLE! Thank you, Lucinda! It was a heartfelt post, for sure.